Today is World Book Day which is a celebration! It’s a celebration of authors, illustrators, books and (most importantly) it’s a celebration of reading. In fact, it’s the biggest celebration of its kind, designated by UNESCO as a worldwide celebration of books and reading, and marked in over 100 countries all over the world. Today we are looking at something I have been waiting to see for over 4 years and that is Simon Martins first published short story in the British Railway Stories series. Simon (Simierski) has been producing the British Railway Stories series on YouTube since 2006 I believe and has amassed quite a following with over 7,600 followers and just over of 7,750,000 views which is a testament to his work. The novel features the same characters as the much loved YouTube series but are set in different universe which isn’t limited by what Simon was able to produce in 00 scale. 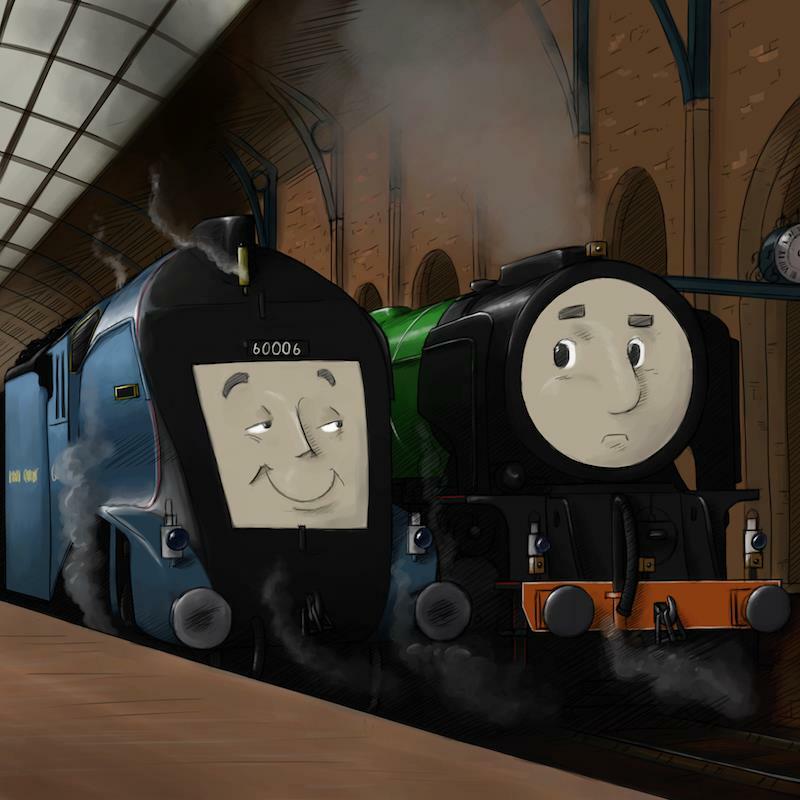 This also allows Simon to expand the story to include locations such as King Cross Station and Shed, Leeds Station and other places along the East Coast Mainline and also allows him to stick almost 100% to what almost really happened. A prime example is this brilliant piece of artwork by Dean Walker which shows “Pacific” on the return leg to Copley Hill and below to it is the photo it was based on which shows 60114 W.P. 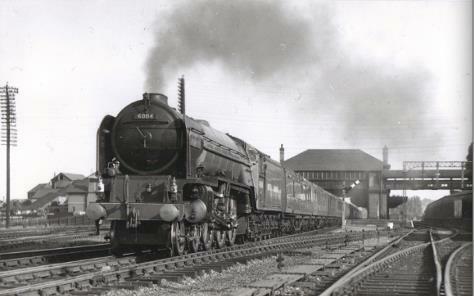 Allen thundering through New Barnet Station. 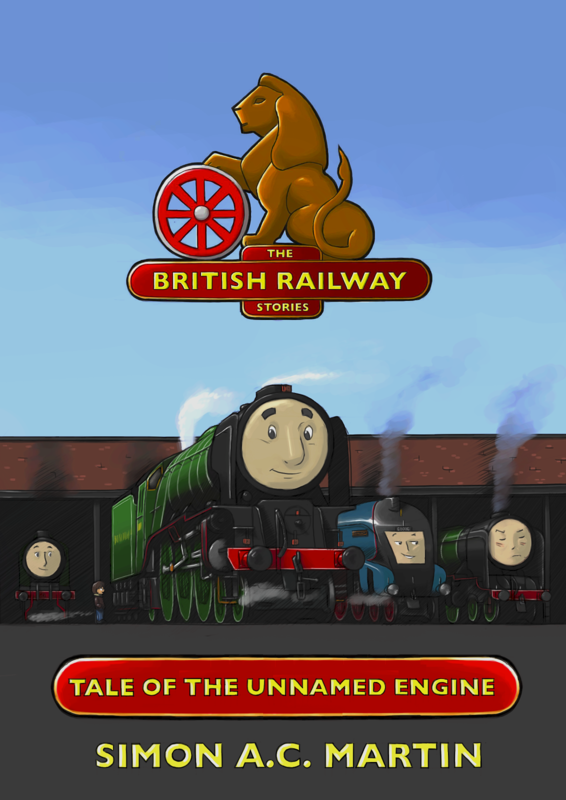 The thing I love about Simon Martins British Railway Stories is that the characters and locations are based on their real life counterparts, this is a historically accurate series which allows to appeal both adults and also children of differing ages. 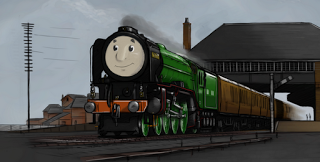 This is perfect someone who is looking for something a bit more advanced that the basic stories you get with the Rev W Awdry’s Railway Series or any other children’s railway series currently on the market. Now to the novel itself the“ Tale of the Unnamed Engine” tells the story of a young boy called Stanley who finds himself in a museum (The National Railway Museum in York tho its not mentioned by name) filled with talking trains, and with the help of an old steam engine, travels back to the late nineteen forties, to experience Britain’s steam railways like never before! The story is a good length and from my experience (bedtime reading to my 4 year old daughter) the book through the quality of the pictures and is not only able to keep the attention of younger children but also be enjoyable and funny for them. 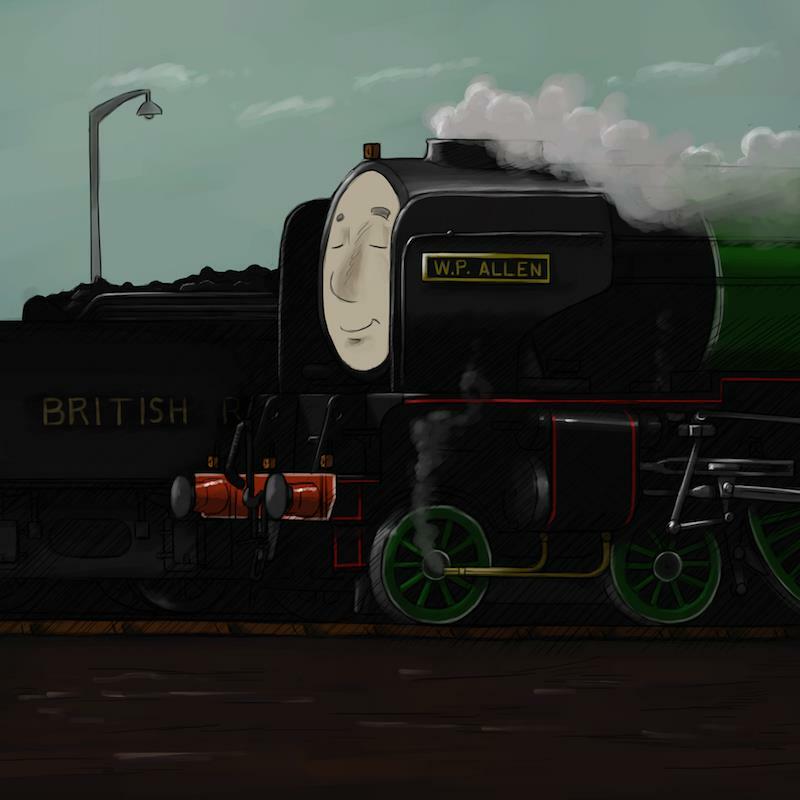 Sir Ralph was called a silly little train on more than occasion. However after you finish reading the novel the book is not finished with the inclusion of some information pages . This includes facts about the characters and the real life locomotive they are based on, classification of locomotives and information on the locations used which is a great idea and is perfect for children who will wish to learn a little bit more about the things they have been reading about and the history of Britain’s railways. The information has been well written in that it’s informative to children but not patronising to the adult readers. This is the best book I have bought for a long while and I cannot wait to see any future installments from the series. What Simon Martin has been able to produce is something truly amazing and it’s obvious the children (and adults) who read this is the passion that has gone into and truly appreciate it. Simon is currently writing a second book called “Great Western Glory” which is due for release this year and I look forward to reading it. My last words on this review is simply Simon Martin and Dean Walker take a bow because what you have produced is just stunning!